I think I’ve mentioned before that this was not our best gardening year. The heat and lack of rain over the summer, combined with me not making the garden a top priority (or really any priority), led to frequent grocery store runs in order to get the fruits and veggies we desired. We did eventually get some tomatoes after having to plant a second batch due to a couple of dogs having a nice dig. A few okra and berries blessed us with their appearance as well, but neither provided us with enough to do anything worthwhile. Unfortunately everything else in our backyard garden was a no-show. 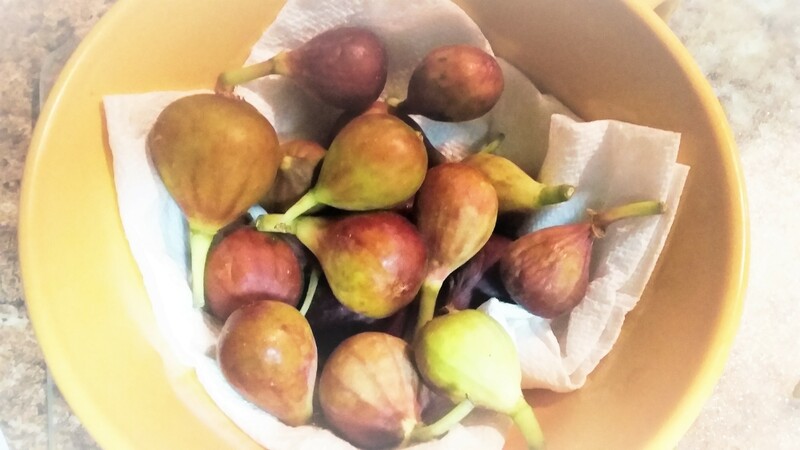 I was beginning to think our beloved fig tree wasn’t going to do anything either, but lo and behold it finally decided to give us some figs at the very end of August. 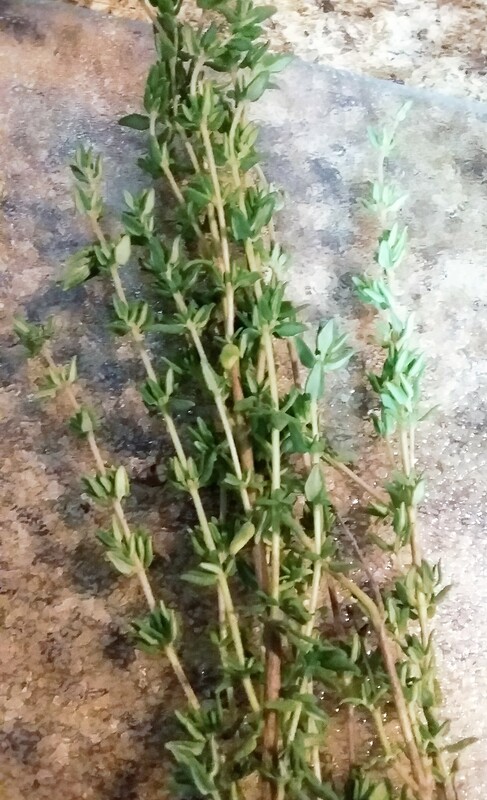 I picked what I’m pretty sure will be our final harvest last week and even though they were tiny, you better believe I was going to do something with them. I should mention here how much I love figs. 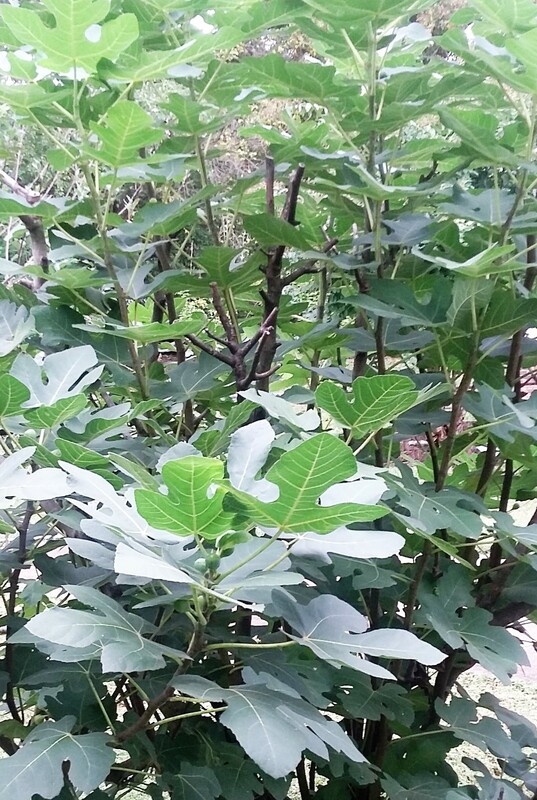 I never knew this until we planted a fig tree simply because I thought the tree was “really pretty”. I knew I liked fig newtons, but who doesn’t like sugar-laden fruit cookies? I’ve collected a pretty good number of fig recipes because there’s actually a lot you can do with them. Who knew? I only pulled 16 tiny ones this last time though, so I was a little limited as to what I could make. 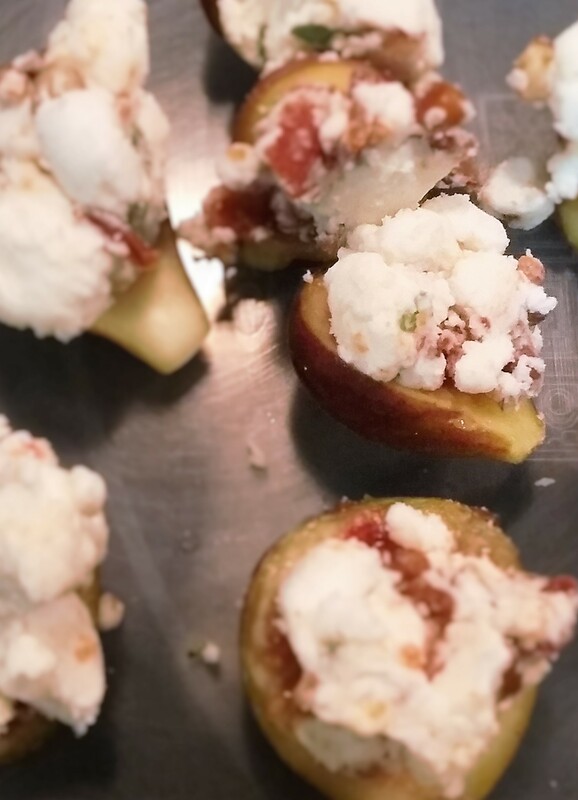 We just so happened to be hosting a small dinner party Friday night so I decided to use the figs for an appetizer which I have made several times because it is just that good. 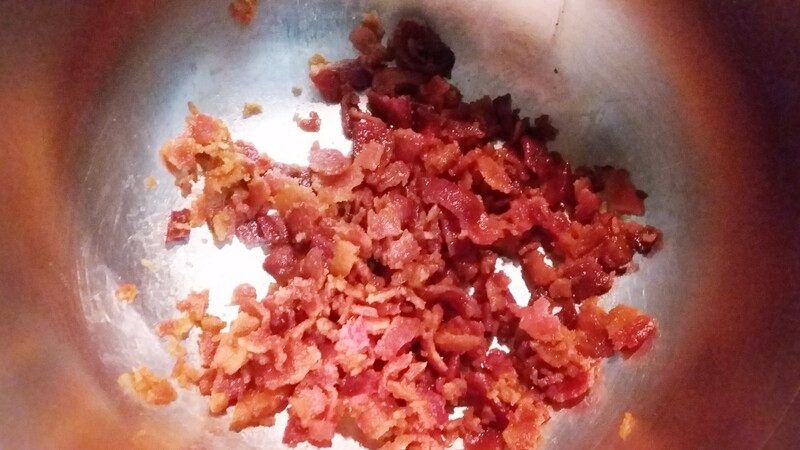 The recipe came from a 2010 Southern Living magazine which was handed down to me from my mom, because as much as I love some Southern Living, Lord knows I haven’t been domesticated for that long. I highly recommend this one for a quick, easy, and unique app. Place pecans in single layer on baking sheet and toast for about 2-3 minutes. Place baguette slices in single layer on baking sheet and bake until lightly toasted (about 5-6 minutes). 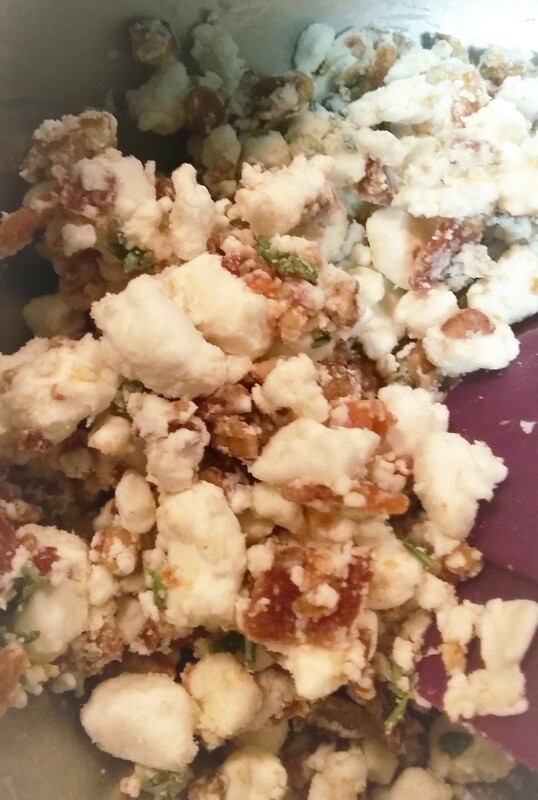 Stir together bacon, goat cheese, pecans and thyme. Look at that deliciousness. 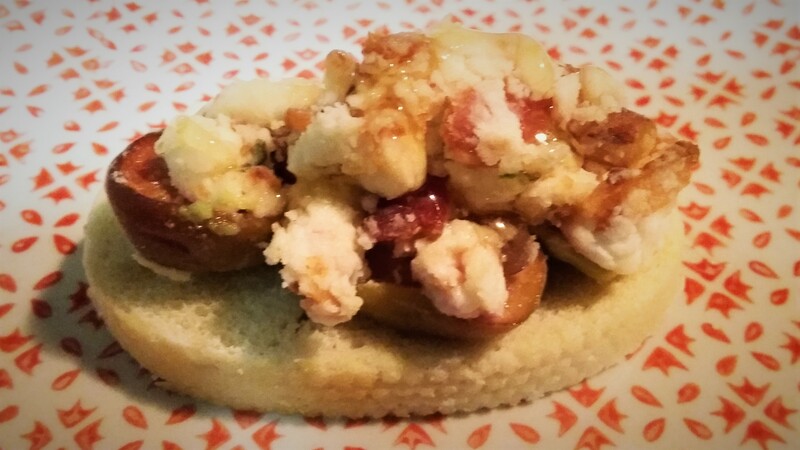 Cut figs in half. Aren’t they just so pretty inside? Press back of small spoon into centers of fig halves to make small indentations. 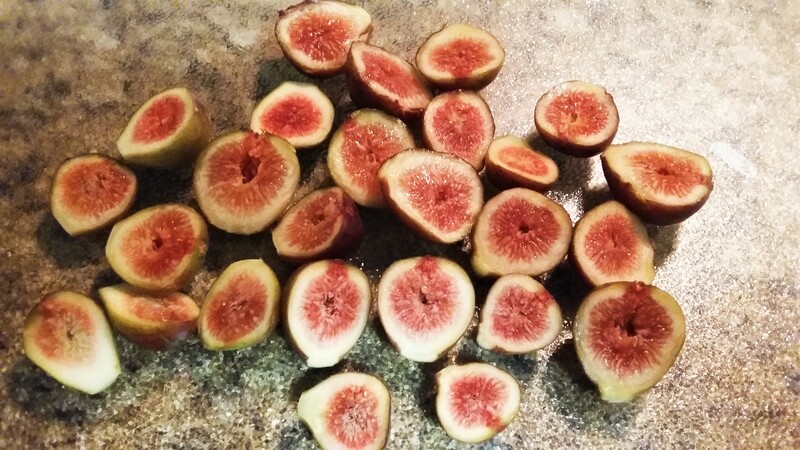 Place figs on baking sheet and bake for 7 minutes. Carefully place 2 fig halves onto each baguette slice. Drizzle slices with honey, serve immediately, enjoy thoroughly, and go back for seconds. So you planted that fig tree? Wonder if I could plant one… How long did it take to start producing fruit? Does it need a lot of sun? 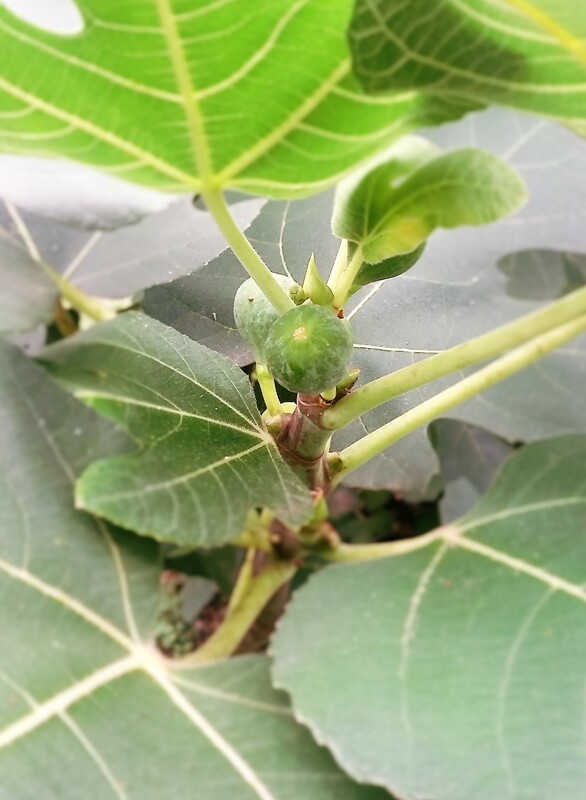 Yep, we planted it about 4 years ago (in the Fall) and we got figs the next year! It does need full sun or the figs won’t ripen. They get pretty big too, but you can always prune them back. You’ll get less fruit by doing that but unless you prune it a ton it should be okay. Go for it! Do you have a good spot?